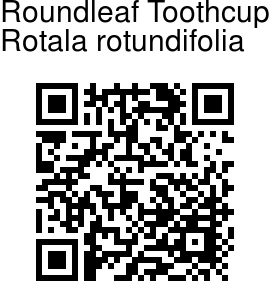 Roundleaf toothcup is a perennial herb with stems usually branched, erect, floating or creeping, to 30 cm long. Stalkless leaves are broadly elliptic to circular, to 1.2 cm long. Bracts are ovate, obtuse, to 4 mm long. Pink flowers are nearly stalkless, in prominent many-flowered racemes. Sepals 4, triangular, to 1 mm long. Petals 4, inverted-egg shaped, 2-3 times as long as sepals, mauve. Capsule is spherical, about 1.5 mm in diameter. 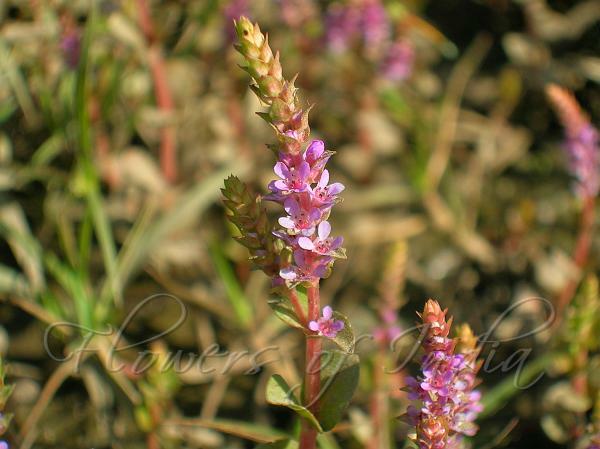 Roundleaf toothcup is found in marshes, streamsides, paddy fields and mountains of the Himalayas, eastwards to NE India, China and S. Japan, at altitudes of 300-2300 m.